Trust International Insurance and Reinsurance Company B.S.C. (c) 'Trust Re' is a closed joint stock company registered in the Kingdom of Bahrain, with authorised capital of US$ 500 million, and issued and paid-up capital of US$ 250 million. It is regulated by the Central Bank of Bahrain, as a locally incorporated reinsurance firm with License Number LII/023 and Commercial Registration Number 11503/July 1981. Our Company comprises over 270 employees located in our Bahrain Head Office and Branch Offices in Cyprus and Labuan, Malaysia. We also have a Representative Office in Morocco, operating under the Casablanca Finance City and a Liaison Office in India. Our geographical scope includes the Middle East, Africa, Asia, CEE, SEE, Russia and CIS countries. 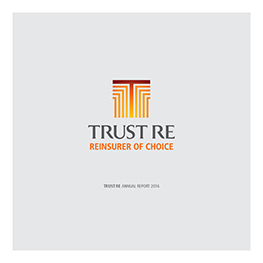 Trust Re provides reinsurance protection to many leading direct insurance companies in its geographical area of operation, in the form of annual Treaties on proportional and non-proportional bases with a sizable underwriting capacity. We offer Facultative reinsurance in the following classes: Oil & Energy (offshore and onshore), Marine Hull & Cargo, Alternative Energy, Property, Engineering, Specialty Lines, Aviation and Affinity. Our service offering also includes Life and Health reinsurance. We enjoy strong relationships with blue-chip, international reinsurers. This further enhances our security, already provided for by our strong capital position. Publications created by Trust Re about the global insurance and reinsurance market.